This could be you, lovebirds. Photos courtesy of Le Meridien. You know what they say: Marriage is a tropical paradise. (Okay, nobody says that.) But if you have the cash, the wedding certainly can be. BORA BORA – I could die today and that would be okay, I whispered to myself. The crazy thing was that I meant it. Lying alone, in a lover's paradise, on my tiny, private beach on a Bora Bora motu with my eyes closed, I drank in the sounds. With the water tickling the pebbles at my feet and the crash of the waves hitting the barrier reef in the distance, I was in paradise. And if I felt this good on my own, I couldn't even imagine the pleasure of this place with my lover. With 118 islands and atolls making up French Polynesia, it's impossible to see everything the first time, which is the very reason to camp out in one spot, determined to return. Many of the islands are low-lying, uninhabited sand masses that can hardly be seen above the breaking waves, while others have high-reaching peaks with narrow beaches. Tahiti is the largest island of the Society Archipelago, while Bora Bora is most common for romance getaways, and for good reason: It's fringed by a barrier reef that has created a magnificent lagoon of translucent waters and an excellent underwater playground. There are endless establishments to choose from, catering to couples of all kinds — you are free to be yourself. 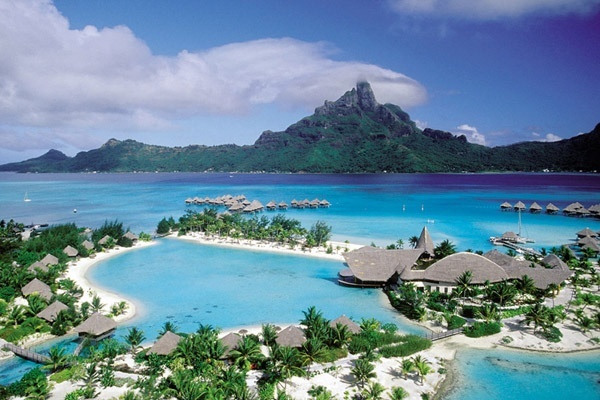 Why escape to Bora Bora for your honeymoon when you can get married on the island paradise? Below are four standout resorts for wedding ceremonies, all of which include the tropical fundamentals: bungalows over water, great food, white sand beaches, and innumerable adventures (if your heart desires). No bridezillas here. The spectacular was the first in French Polynesia to have a full-time wedding planner on staff — one who will indulge your every whim. There's a spa with luxurious treatments for your ladies-in-waiting, as well as a dress designer that will craft an original piece for you. Even better, the entire resort is as adaptable to your ideal ceremony location as a chameleon is to its jungle. With seating for groups as intimate as six or as grand as 200, you can say your vows on a white sand beach in a flower-embellished gazebo or near a lushly landscaped pool with a waterfall and views of glorious Mt. Otemanu. Lagoon Restaurant by Jean-Georges is also an option, as is the 13,000-square-foot for couples who want to celebrate with a house party. Bridesmaids can throw a Bikini Bonding cocktail party in the lagoon, and waiters will wade out to join you with tray service. As an alternative to the post-ceremony departure by car, the bride and groom can fade into the horizon via jet ski. A sea of blue. Photo courtesy of Le Meridien Bora Bora. It's all about the scuba ceremony. That's right, you can actually get married underwater, underneath an A-frame chapel, swimming priest and fish included. But the real standout at is management's respect and support for local Polynesian staff, which makes the employees feel a sense of propriety over the resort. This translates into guests being made to feel at home, and when it comes to planning your wedding, this is key. Couples are encouraged to personalize their ceremony (you want magenta fireworks, you've got it). You can also choose to keep it simply paradise: a traditional ceremony on the beach with a Polynesian priest before a flower-decorated altar under the coconut trees. The bride is carried in on a chair, the groom travels by canoe, and everyone wears gorgeous leis. A dozen dancers and musicians welcome the couple, and the finale is nothing less romantic than a shower of flowers. If you opt out of the overwater bungalows, the garden suites at have enclosed terraces with private outdoor hot tubs and showers. There's nothing to stop you from starting your own nudist colony here, population two. Oh the possibilities! Besides beach and food, the only other reason to leave your suite is the Taurearea cocktail lounge, where you can listen to live acoustic guitar. If that doesn't put you in the mood, the outdoor couples' massages will. Other romantic inspirations include a Champagne sunset cruise with gentle trade winds rocking you just right and a private outrigger canoe tour with local legend storytelling by a guide. The main hotel at has excellent beds in bungalows right on the beach. A neighboring private island, part of the same resort, feels very secluded, with beautiful terraced pathways climbing to a hilltop where you can indulge in a sunset cocktail. If you and your love are afternoon sun worshipers, the private island is a better bet, as the main island loses sun behind the high mountain peaks in the later hours. Private island guests have regular access to the main island for all amenities. Keep an eye on the Sofitel, which has plans to further develop the private island hilltop with a pool and to modernize the interior design of its overwater bungalows on the main island. These folks are on island time, but you should be too. It's all part of the charm. Proof that you actually did it. Photo courtesy of Le Meridien. 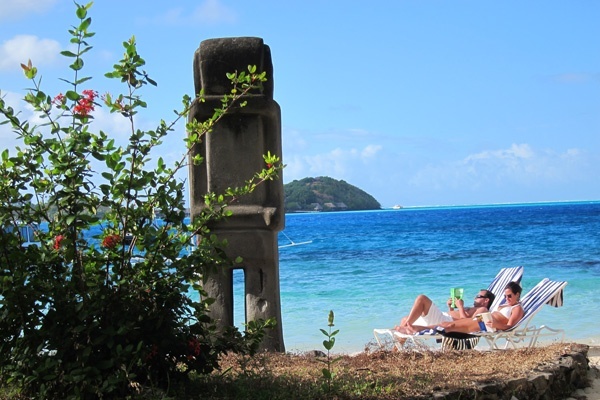 Even though people have been organizing wedding ceremonies in French Polynesia for years now, it is only since 2012 that couples are allowed to be legally married here. Similar to the American system, the couple must make a separate trip to the local town hall for the civil ceremony. 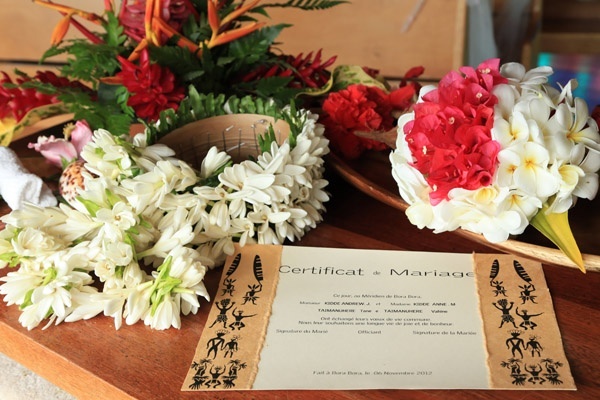 Many couples choose to have the ceremony on the island and keep the civil service for home, while others feel it's symbolically essential to have the legal part executed in the same destination. Hotels are able to assist with the details of the administrative procedure, adding romance to the process wherever possible. Marguerite is a Californian writer and editor living in Sri Lanka. She is currently curating a book of living around the globe. You can follow her on at @margueriterichards. She travels to understand cultural differences and the nuances that separate us, with the resolve to build understanding through her work.